I have always wondered what it was like to be the one who helped Christ carry the Cross down that dusty difficult road. To be the one who was pulled aside and forced to bear a burden that had to seem too much to take on…to be compelled into compassion, completely surrendered to serve in a moment that must have been overwhelming. I have often wondered if I would have understood the privilege of walking up that road with Him. When my children were little, we would read the accounts Jesus’ last days from each gospel as a part of our preparation for Resurrection Sunday. We would wander through the Word together and no matter what part we would read, I always found myself holding my breath through it. Somehow I wanted to change the pain He endured. I wanted to take it all away and to make it different. But I can’t… it was necessary. Just like Simon’s journey with Jesus as he carried the wood to the hill with full knowledge that death was the intention. Isaiah tells us of the physical change in Christ… of the beating that marred the body of the Savior. It is written that He was unrecognizable. And His physical weakness, the extent of his wounds and injuries so massive, that the human part of Christ was not capable of carrying the beam that was meant to humiliate Him. I always want to skip through the hard and the scary and the difficult parts and go right up to the glorious part, where death was conquered and the shouts of joy were sounded. Where the angels show up and He is shining victoriously in preparation to see the Father. But we can’t sift God’s Word into sections, can we? We can’t skip over pieces that we don’t want to read just because we don’t understand them. Yet, I think of Simon and his journey up that road to Calvary with Jesus… Did he recognize the moment for what it was? Did his heart still have hope when his eyes didn’t understand what he saw? Did his faith, if he had any, waver at the prospect of this grim task? Did he recognize the Savior or see a man? And how many times are we, too, walking that road carrying our crosses with Jesus and not recognizing Him? Perhaps we need some perspective to open our eyes. 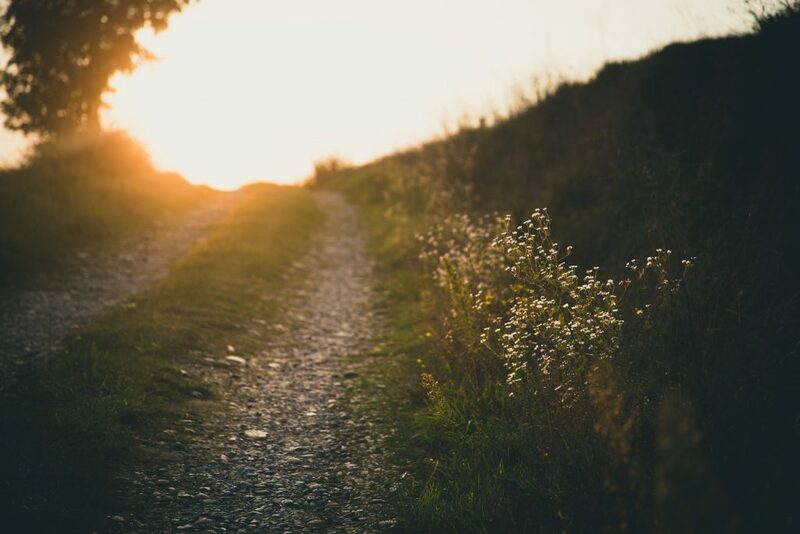 Maybe the reality that right there in that space, where Christ was fully there… maybe that made it possible for Simon to lift the wood and take steps up a hard hill. Perhaps, in His presence, grace spilled out of the Holy One, as only the atmosphere around Him must be, and even in the unfairness of the moment, hope was still there. Because grace changes the way we see everything. 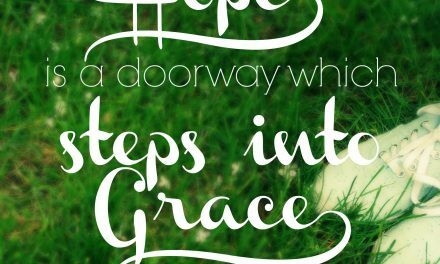 It alters our view in such a way, manipulating our sight, so that we can look right into the hard and the difficult, the brief and fleeting moments, in order to see hope and faith through the revelation of grace. That trail of dust, carrying the beam meant to crucify hope didn’t seem like grace. Yet, the journey was a part of the ransom which brought forth the redemption we all need. He works on our hearts in those calvary-road-kind-of- trials. He changes us, marring us for eternity as we choose Him. By the glory of grace our sight becomes clearer, our perspective has purpose, our hope is illuminated, faith enlightened. Illuminated hope is a lens of purpose shining bright on the glory of the Gospel. Enlightened faith is a magnified optic that lifts the message of salvation into clear view. Revealed grace is a transparent window through the veil of disillusionment making His promise visible. 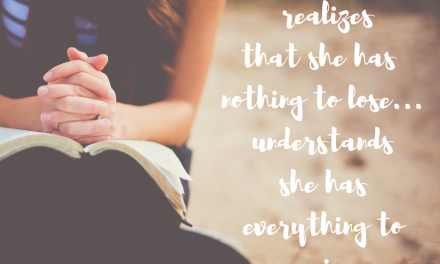 The more we read the story, the more we practice following His journey…the more He reveals the purpose of grace. Because what He works in us, through the fire, through the trial, even the dirty-road cross-bearing journey, is an eternal glory… a weightless wonder that capitulates grace as our focus. Each difficulty we meet on the roadway that is life, is momentary in the light of eternity. As we look through the Cross and straight up to God… our vision is corrected. We see anew, miraculously… because we see Him. Because grace in focus looks through the temporal view; it sees beyond the minutia of now into the forever of His Will. 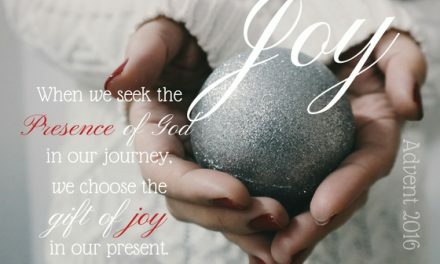 It looks right into the fixed message His light shines upon…to the place where grace illuminates His purpose in our waiting and hoping and praying and seeking and wondering, and especially in our calvary-road cross-bearing journey. 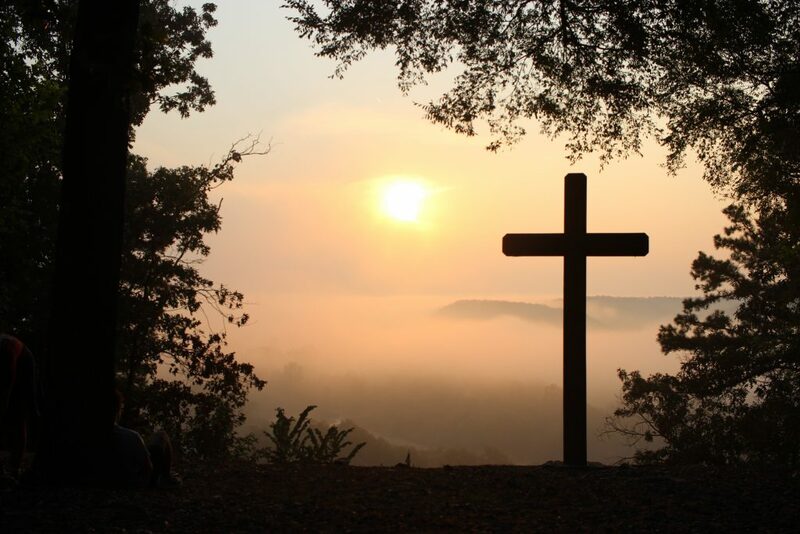 I have wondered how Simon was able to bear the burden of holding up the Cross with Christ. Yet as I continually read His Word, I see His love reaching beyond the unbelievable and making a way where it seems impossible. It was with Christ that he walked to Calvary, as we all should. Truly, it is with Christ that every burden can be lighter. Shared with Jesus, the beams that we are forced to carry, which feel so heavy, can easily be lifted and set aside. As we walk our Calvary Road, we imitate the path He took. We carefully choose only the steps He is directing us to take, rolling each care upon Him in faith. Each prayer becomes a confession on the journey, as we lean into His understanding and pursue the ultimate purpose of leaving it all at the foot of the Cross. Here we learn to trust what we don’t see, let go of the weight the world places on us, and look beyond the cross into the ocean of His delivered grace. As I am contemplating the steps Christ took, bearing the weight of the world on His shoulders… having born the weight of my sin on His back… I am reminded of the solemnity of His journey. Always, I am in awe of the way He fulfilled His purpose completely. Gratefully, I am reminded that even though we rejoice because He conquered sin, death and the devil, there is deep beauty and redemption in the way we pick up our own cross and willingly following Him. Humbly, I surrender because I can trust that I will never actually carry it alone. 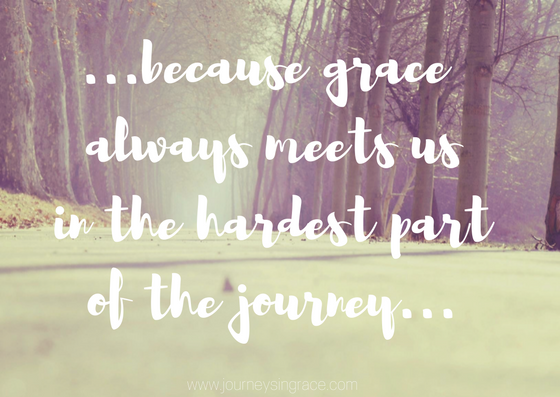 Grace will always meet us in the hardest part of the journey. 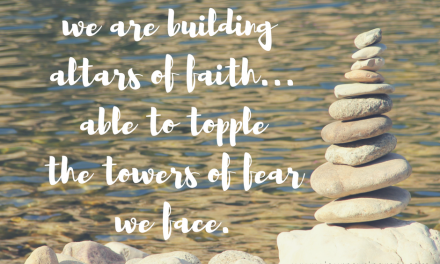 Though we are pressed in, pushed down, covered deep, shaken raw, troubled greatly, persecuted and perplexed…. we are not despairing or destroyed by the circumstances that disrupt our journey. 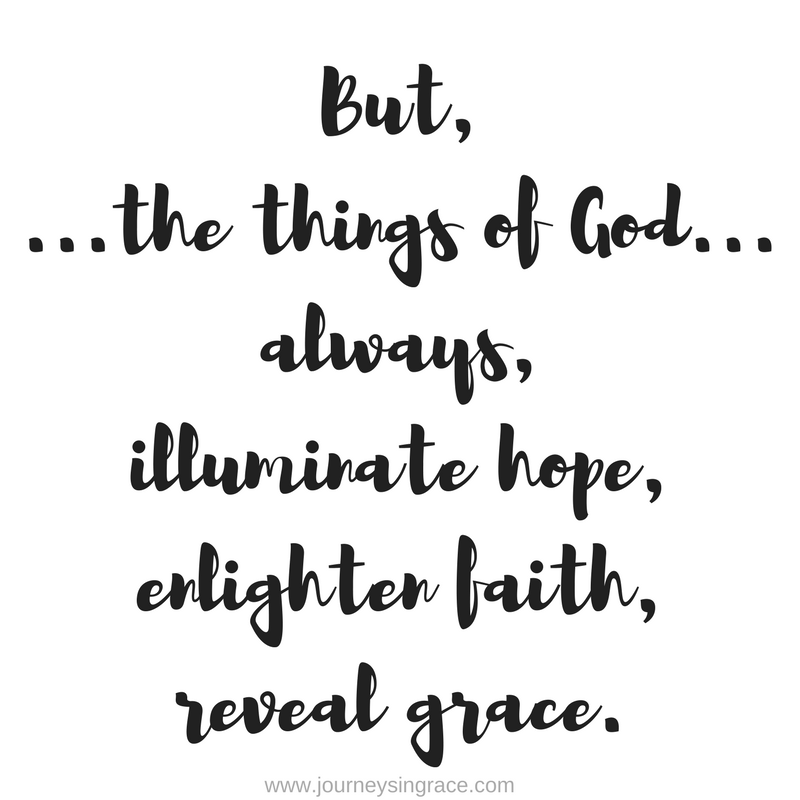 Because redundant grace abounds in us to the glory of God and we see the ransom of His love as the light that brings hope and faith when our world seems out of control. And like Simon we can journey with Jesus up the road to Calvary because we already know that He has given us the strength to count each step as a moment of grace. Praying for many moments of joyful grace this Easter as you rejoice in the resurrection of the King! Dawn- Lovely post! I feel I miss so much in His journey and take His sacrifice for me for granted. I know this to be true!